As a shop owner, you’ll be hard-pressed to find a wider selection of butterfly garlands anywhere else. World Buyers’ selection of butterfly string garlands has more than 120 color and design combinations. Whether you’re looking for garlands for the home or events and weddings, you’ll find them here. Shop butterfly garlands with World Buyers for a wide range of colors and styles! Organza with silver and white glitter plus clear jewels. A wedding favorite! 8 Large Monarch Style Butterfly Garland. No glitter. Beautiful blue butterflies in several sizes. 9 per strand. Eight vivid spring colors combine to make a rainbow of butterflies! Largest size is 7.5"wide. Bright Spring colors in blue, orange, pink and greens. These butterflies have wing tips! Browns, golds and cream with Glitter and touches of "wine". Elegant white butterflies with silver and gold glitter. Ideal colors for winter holiday, celebrations, and weddings. Popular multi colors in mixture of large and smaller sizes. New color is different than what is in current catalog. Very pretty with shades of blues, lights and wing tips. No glitter. A very popular butterfly with feathers in center also. Gold and blue glitters. Fuschia and Aqua and gold glitter accents. 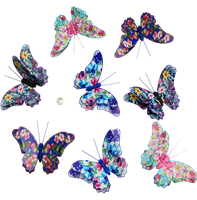 The best selection of butterfly garlands with countless colors and sizes Every color of the rainbow is included in our huge selection of butterfly decor.